For some lawyers, issuing certificates of patriotism appears to have become a full time activity. Meet Sunkari Janardhan Goud, a Hyderabad based lawyer who has lodged a complaint against 7 top national leaders including Congress Vice President Rahul Gandhi and Delhi Chief Minister Arvind Kejriwal accusing them of sedition. The Cyberabad police registered cases against 9 accused following the complaint. Besides Gandhi and Kejriwal, the accused include CPI(M) General Secretary Sitaram Yechury, Congress leaders Anand Sharma and Ajay Maken, Janata Dal (United) leader KC Tyagi and 2 JNU students Kanhaiya Kumar and Umar Khalid. According to Goud, JNU has become a hub of anti-national activities. And he has accused the 7 leaders of supporting these activities by visiting the University campus on 13 February. He says that their visit amounts to expressing solidarity with the students "who participated in anti-India and pro-Afzal Guru protests". As evidence, he has provided visuals of the controversial event and paper clippings of the leaders visiting JNU. The Congress has dismissed it as a politically motivated complaint. 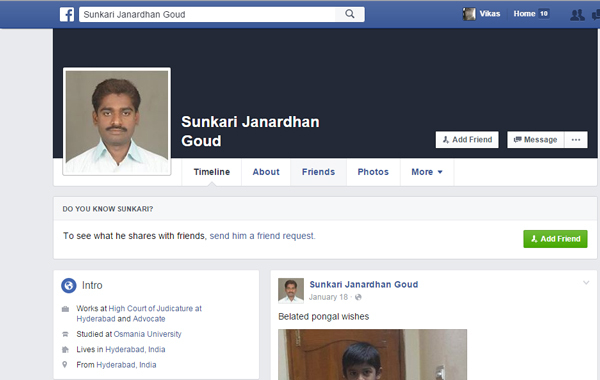 But Goud claims he doesn't belong to any political party and that he filed the complaint as a "patriotic Indian". Goud's claims of being apolitical aren't quite true. Even a cursory look at his Facebook timeline reveals that he is a BJP supporter. He has shared pictures of himself at Sushma Swaraj's public meeting in 2014. 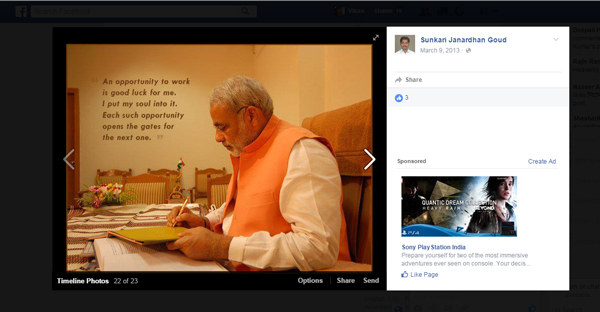 He also seems to be a fan of Prime Minister Narendra Modi and has shared his picture with a quote. His ideological affiliations are also evident by another, rather graphic photo he has shared of Hyderabad's Charminar surrounded by saffron flags and Lord Ram standing on top of it. While it is not confirmed whether he officially belongs to the BJP or not, he has shared content from the Hyderabad BJP's legal cell. This isn't the first such case that Goud has taken up. Last year he had filed a petition against the beef festival that was supposed to be held at Hyderabad's Osmania University (OU). Goud is reported to be a research scholar at OU's law department. The festival was being organised by the Democratic Cultural Forum, a group of 25 students at OU. The festival had the support of Leftist and Dalit student bodies. The court put a stay on the festival as a result of Goud's complaint. The police also acted against the festival and arrested a number of students, many of them Dalits. BJP MLA from Goshamal, T Raja Singh, had warned of "Dadri like consequences" if the festival was held. Another case that Goud had taken up was against a US-based liquor company New England Brewing Company for using images of Mahatma Gandhi for its product called Gandhi Bot beer.